From PNAS, reproduced under Fair Use provisions. A new study on the neural correlates of the LSD experience has just being published, to great fanfare. Naturally, the mainstream media is all over it, because of the loaded history of psychedelics. The Guardian published an article and so did CNN, even with front-page visibility in its website. As many of my readers know, the same group that carried out this study has published other studies earlier, in which they've shown that psilocybin (the active ingredient in magic mushrooms) only reduces brain activity, instead of increasing it. See this earlier essay, as well as this one. Such results are counter-intuitive from a materialist perspective since, if brain activity indeed constituted experience, the mind-boggling psychedelic state should correlate with more brain activity, not less. So the key question of interest in this new study is this: Does brain activity increase or decrease when the subjects are under the influence of LSD? Let's focus on the question above and see what the study has to say about it. The researchers first show that a localized increase in cerebral blood flow (CBF) does happen in the visual cortex of the subjects. This is shown in Figure 1 of the paper, which I link below for ease of reference. The third row of images (from the top) shows the CBF difference between placebo and LSD. The small red dots at the back of the brain show the increase in CBF. One must be cautious of proxy measures of neural activity (that lack temporal resolution), such as CBF ... lest the relationship between these measures, and the underlying neural activity they are assumed to index, be confounded by extraneous factors, such as a direct vascular action of the drug. Rather than speculate on the above-mentioned discrepancy, it may be more progressive to highlight the advantages of ... MEG. Clearly, there is a whole lot of blue, which indicates broad reductions of brain activity in the LSD state, when compared to placebo. This is what the paper actually concludes, suggesting that the localized increases in CBF observed in the visual cortex may be attributable to measurement artifacts. Images of the brain under a hallucinogenic state showed almost the entire organ lit up with activity. The visual cortex became much more active with the rest of the brain, and blood flow to visual regions also increased. Huh?! "Much more active"?! This is not said anywhere in the paper. Localized increases in blood flow, as we've seen above, were indeed observed, but the researchers themselves do not conclude that this means an actual increase in brain activity, let alone the visual cortex becoming "much more active." 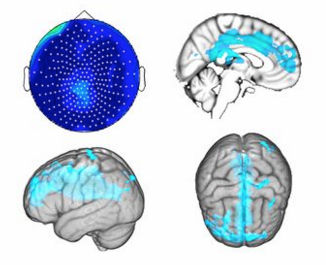 A second image shows different sections of the brain, either on placebo, or under the influence of LSD (lots of orange). Not only does this caption fail to mention what the figure is actually showing, it adds the evocative "lots of orange," as if it were clear what all this 'orange' means. Well, it isn't clear because the Guardian removed the explanation of what it actually means! Let us be frank: if you were a casual reader looking at the picture, as edited and published by the Guardian, and reading its caption ("lots of orange"), what would you conclude? You would, of course, conclude that the picture shows a brain lighting up like a Christmas tree under the influence of LSD. Yet that is just about the opposite of what the technical paper says. When the volunteers took LSD, many additional brain areas—not just the visual cortex—contributed to visual processing. That's it; it's just as simple. Clearly, the Guardian journalists chose one specific figure to illustrate their article (out of the five available in the original research paper) so to show a dramatic increase in something going on in the brain under the influence of LSD. Only Figure 2 of the original paper shows this, none of the four others does. The journalists also manipulated the text in the figure itself, as well as its caption, in such a way that most readers will likely interpret this something as brain activity itself. Obviously, such editing renders the message of the Guardian article much more consistent with what people expect to see under a materialist paradigm, which states that brain activity constitutes experience. I cannot pass judgment on what the motivations or intentions of the journalists were, but their choices portray the research results as confirming materialist expectations. That the results in fact do the opposite (see this essay for an explanation) is not discussed anywhere in the Guardian's article. Why not? Why these choices? It gets worse. The CNN article is guilty of more than just being misleading: it's outright incorrect. To say that the results "showed almost the entire organ [i.e. the brain] lit up with activity" is sensationally wrong. The figure that likely motivated this assertion (Figure 2 of the original research paper) doesn't show raw brain activity at all, but RSFC, which is something else. Think about all this and make your own conclusions before reading on. The most vexing aspect of nature from a materialist perspective happens to also be the only carrier of reality anyone can ever know: consciousness itself. Indeed, materialism would make a lot more sense if consciousness didn’t exist at all; if the entire universe consisted simply in the mechanical unfolding of unconscious processes. Clearly, it doesn’t. So how could a metaphysics that fails to explain – even in principle – the one obvious aspect of existence attain, and maintain, the status of reigning worldview? Many indications are provided in the essays of this chapter. ... essay 3.5 discusses the effects of psychedelics on the human brain, as well as their implications for the materialist axiom that the brain generates all experience. This essay was the most unsettling for me to research and write, for reasons that will become clear to you after you’ve read it. For a while, in the interest of avoiding polemic, I considered not including it in this book. Yet, precisely for the reason it is so upsetting to me, essay 3.5 is probably one of the most illustrative of the overall message of this work. With the repeat of this kind of media bias I witnessed today, I am glad I included it. That essay has now gained renewed relevance and importance, and I urge all people interested in these psychedelic studies to peruse it carefully. Materialism serves powerful economic and political interests. ‘If our confusion suits the reigning political and economic regime just fine, it is because it stands as proof that the operation to supplant the dream-space of soul and psyche with a fully controllable interface is going according to plan,’ writes Jean-Francois Martel. What forces stand to gain from the continuance of materialism? How do these forces manifest themselves in society? Questions like these evoke the idea of conspiracies. Yet, our ordinary view of conspiracies tends to be rather caricatural: secret, powerful organizations working behind the curtain, whose goals and actions are deliberately orchestrated by hierarchies of control with an elusive leadership at the top. Secret meetings are allegedly held, secret orders issued and disseminated through myriad covert channels. Everybody in a position of any significance in society is allegedly involved; everybody except us. How likely is all this? You see, this caricatural view of conspiracies helps to protect and preserve what is really going on. If our only choice is to either believe in the caricature or absolve all players of all guilt, it is easy to see how the world is kept entranced. It has become practically impossible to reclaim the more moderate denotations of the word ‘conspiracy.’ So let me try a different word: stigmergy. Stigmergy happens when agents co-ordinate their actions indirectly, through the local effects of their behavior in the environment. These local effects influence subsequent actions by other agents, whose effects, in turn, influence the behavior of yet other agents, and so on. This way, local actions by different agents reinforce and build upon each other, leading to the spontaneous rise of globally co-ordinated, systematic activity. Ant and termite colonies, for instance, operate according to stigmergy: there’s no hierarchy of control, no elusive leadership, no broadcasting of secret orders. Yet, the resulting behavior is systematic – following a clear global agenda – as if it were centrally co-ordinated by some kind of secret cabal. There is vicious, insidious stigmergy in our society today. The agenda of this stigmergy is the maintenance of materialism. It manifests itself as a broad network of subtle local actions, biases and values, each serving powerful interests. These local dynamics build up into a system of global reinforcement; a virtual cabal, so to speak. The stigmergy has turned most of us into entranced drones, serving a mad state of affairs that is slowly but inexorably killing our humanity. While reading this essay, you’re thinking more critically about this specific study. But how many similar articles about other studies have you casually read over the years? How many of your implicit beliefs and convictions today – ‘facts’ you take for granted – have been subtly created through exposure to similarly misleading hype? Scary, isn’t it? All I can do is to raise the alarm, through essays like this, every time I see an instance of misleading and even outright false journalistic reporting of scientific results, whose agenda is to massage everything into the boundaries and expectations of materialism. I have no delusions that my efforts make much of a difference, but I do what I can. The rest is up to society at large. wow... amazing: "Clearly, there is a whole lot of blue, which indicates broad reductions of brain activity in the LSD state, when compared to placebo. This is what the paper actually concludes... this is all abundantly clear in the scientific paper but, for some reason, the media is reporting precisely the opposite!" Bernardo, there are many of us who greatly appreciate you "fighting the good fight". I am a big fan since reading "Why Materialism is Baloney"... and now on the final chapter of "Meaning in Absurdity" (Another fantastic book that I rather coincidentally started reading after an extensive foray into Jung's writing) Did you ever check out "Time and Memory: a primer on the scientific mysticism of consciousness" by Stephen Earl Robbins? I have a strong sense that you could be helpful to each other, your work is complementary. Thanks for the suggestion, Hugh, I will have a look! I'm interested to know more about the implications of this 'agenda of maintaining materialism'. What is the gain? What are the alternatives? Does it merely allow for simplistic explanations of complex issues? Keep up the good fight, and take time off when you need it to recharge. On a more serious note, I just saw the reference to Robbins' book. He and I have exchanged letters from time to time. He mentions, in that wonderful book, that his orientation as a psychologist (brilliant guy; taught statistics for years) changed in large part due to what he referred to as an experience of the Self (Atman) on a balcony in Hanoi, Vietnam when he was stationed there during the war. Very creative mind and his writing is well worth looking into. In my experience : everyone whom I knew for a fact were taking many doses of LSD and/ or psilocybin mushrooms degraded intellectually , some times to very poor level. Usually degeneracy manifested itself after 40 years of age. Some turned into complete idiots, losing even common sense. Alcohol does even worseon the drunks.On the other hand druggies who used cannabis and opiates did not manifest degeneracy of the same kind. Well, opiates is just a one way street: never to be fixed again, a subject is never cured but intellectually may remain at the level. Potheads on the contrary manifest unusual insights. My observation relates to roughly about 100 people i knew personaly and was observing in the last 30 years. Kabud, there is no scientific evidence for toxicity or intellectual degeneration from the use of psilocybin or LSD. Emergeing evidence in fact shows the opposite: heightened creativity, well-being, potential for treating depression, anxiety, etc. I would also challenge the claim that pot does no damage, not based on stats but having seen a few people's lives severely disrupted by it - schizophrenia and suicide amongst others. Of course it's a chicken and egg situation, but I steered clear of the stuff after seeing what happened to a few folks and am sure glad I did. As for the so-called hallucinogens, I have always had plenty of psychic and spiritual experiences, so never saw the need for such stuff personally. And when I hear of people's experiences with ayahuasca, such as confronting the shadow and all that, much if that happened to me without even trying. In recent years I have sought to keep my energy grounded, and have turned my focus to being present to life, not in getting caught up in psychic and spiritual experiences. They can be useful, and I am sure plenty of people have gotten plenty of insights from them, but in the end we were here to be here, not tripping off to other realms. LSD and natural entheogenic substances as a promoter of well being is not just emerging--- it was the drug of choice among psychiatric researchers in the 50's and 60's, and used to treat end-of-life depression, alcoholism( Bill W., Cary Grant, others...), anxiety, OCD type behaviors and some of it right around the corner from me (where I live nowadays at Spring Grove State Hospital--I met Dr. Albert Kurland in the 90's and he told some great anecdotes. He said they proved that there was no "chromosonal damage" as told us teenagers in the 70's. But acid like any other entheogen must be used as a sacrament, to find answers and new questions---not for kicks. I think its a fair statement that it is only dangerous when people are dosed unbeknownst to themselves, or taken under an inappropriate mindset--or is cases of emerging or evident dissociative personality issues or schizoid mindstates. We must remember that our own human brain produces DMT naturally, and in all our waking consciousness about 5% of what is needed for a full blown DMT experience. Forgot a closing paren---(where i live nowadays)...at SG State Hospital. Bernardo, you give me hope more than you know. And I'm sure others feel similarly. I agree with "Uknown" commenter above. Don't feel powerless or discourage. Don't give up. I certainly couldn't pick up your slack if you did. I really don't think anyone could. Never mind The Guardian - the actual research supports your philosophical position. That's what counts! I have read most of your books so far Bernardo, and each one of them are unique, deep and full of profound metaphors. When it comes to consciousness in the perspective that you put out there, there is no one that explains it with more eloquence, clarity and intellectual honesty than you do. And let's not forget, your intentionality comes from a sincere heart, which is fundamental. So there you go, heart and reason working together. Please carry on with this talented gift of yours for many years to come. Such view needs to be amplified and it will! Keep the good work. Biologically informed modeling has suggested that instability within the primary visual cortex may facilitate the emergence of geometric hallucinations via self-organized patterns of neural excitation (30), and eyes-closed fMRI recordings during ayahuasca hallucinations suggest the visual cortex behaves “as if” there is external input when there is none (31) (see also ref. 29). The present findings of increased visual cortex CBF, expanded V1 RSFC, and decreased alpha power may be seen as consistent with the notion of “seeing with eyes-shut” under psychedelics, because they are all properties normally associated with visual stimulation (32, 33). Cortical alpha has been hypothesized to serve a general inhibitory function, filtering out “stimulus-irrelevant” information (34). Thus, reduced alpha power (9, 29, 35) could have disinhibitory consequences, facilitating the release of anarchic patterns of excitation that manifest spontaneously and experientially as visual hallucinations. This hypothesis is leant (indirect) support by two prior studies that found reduced spontaneous visual cortex alpha power under psilocybin alongside reduced evoked visual responses (9, 29). Further work, using higher-resolution brain imaging, machine learning techniques, dynamic measures of functional and effective connectivity, and improved “capture” of visual hallucinations (e.g., via button press or experience sampling), may help to develop this appealing model (e.g., see ref. 36). Im confused by this , are they saying that increases in the activity of the visual region correlates to hallucinations ? This is about visual hallucinations, "seeing geometric patterns" with the eyes closed. The authors are speculating that when certain brain activity in the alpha frequency range is inhibited (i.e. reduced) this may contribute to visual hallucinations. "Increased visual cortex cerebral blood flow (CBF), decreased visual cortex alpha power, and a greatly expanded primary visual cortex (V1) functional connectivity profile correlated strongly with ratings of visual hallucinations, implying that intrinsic brain activity exerts greater influence on visual processing in the psychedelic state, thereby defining its hallucinatory quality"
Does that not imply that the visual hallucinations are coming a more connected brain? Yes, the increase in resting state functional connectivity (RSFC) in the primary visual cortex (V1) reflects a more synchronized brain, even though a less active one. As a casual reader who doesn't have the time or inclination to read the original study, I'd like to thank you for making these nuances more accessible. This question may be an entry point into deeper insight (with hopefully a side helping of frustration alleviation): What does this apparent stigmergy/conspiracy say about the rules by which our collective consciousness is organised? Thanks Duane. As for your question, I am not sure I understand it. What is striking for me is the fact, that the connectivity increases, leading our minds to the "state of infancy". This is something I was actually thinking during my early adulthood when I experimented with cannabis/mushrooms, because these trips threw me right back into the way I experienced the world as an infant, and boosted my childlike fantasies. This finding is not really that surprising for me, which doesn't make it any less amazing. Moreover. I think, the increased brain connectivity is pretty much consistent with the idealistic framework and the "filter model". As the main connection hubs responsible for our everyday-waking constrained consciousness go silent, the brain goes to the state of not being able to filter out the contents of personal/collective unconscious, which are now free to "roam the unconstrained brain" without being stopped before the doors of perception. And thus corresponding with more transcendental experiences, while still retaining all functions neccessary for reasoning and communication, since the individuals under the influence are still perfectly functioning. And the more interconnected yet less active brain is the image of this de-localisation of consciousness capable of perceiving the things beyond, so to speak. If the brain was simply more active and interconnected, that would be perfectly in the line with physicalism. But since the connectivity rises (filtering hubs are inactive) and there is substantially LESS brain activity everywhere. Now that is amazing. Sorry for my idiosyncratic language, I have some difficulties explaining myself in these topics. PS: The stigmergy, as Bernardo calls it, is really apparent even among intelligent people. I am a biologist and back in the day I showed my colleagues the original magic mushrooms study, the replies were all "that's impossible" or "they must've had made some mistakes, the results cannot possibly show this". It really just comes down to the dominant worldview. Sam, I agree fully with your commentary! Thanks. Oh, dear Bernardo. From your individual perspective, perhaps you sometimes forget how important you are for people. Perhaps you haven't noticed, but you have your fandom. And your book sale send the same message - your efforts are no in vain, but rather amplified by the community you aggregated around you. I have a feeling this is just the beginning. Thanks for the encouragement, Adrian! Someone who tweets, should tweet this url to the Guardian author. Bernardo, don't get too discouraged. You are leaving a trail of breadcrumbs for others to follow, to escape the labyrinth of our culture. And although there is no requirement for you to do so, you continue to bravely and honestly give your observations to others. We will solve this glitch thanks to minds like yours. I appreciate the clarification...my conclusion is that these studies must continue to be conducted, and that people should be free to conduct them, acquire supplies, etc. without interference. That is the fastest way to scientific clarification on these points. You're joking right? Activity doesn't have to "increase" for materialism to be valid, it just has to change consistent with changes in perception. Was there a marked change in brain activity connecting with LSD changes in perception? Obviously there was. I don't see in the response you refuting the correlation of changing perception and changing brain activity which is the basic materialist/physicalist claim and one which the study supports. can't make it any easier or clearer for you here than I already made it there. I believe it is abundantly clear. Hi. I'm not assuming anything, I am just highlighting what materialism, as a metaphysics, states: according to it, certain types of brain activity _constitute_ experience. As such, under materialism, an increase in experiential intensity/breadth _is_ an increase in that type of brain activity. So when there is a significant delta in experiential intensity/breadth without any increase in any type of brain activity anywhere in the brain, it becomes more difficult to defend materialism. Your filter hypothesis is OK but, under materialism, it doesn't change the above. If you take out inhibitory processes, other processes should still become more active for no longer being inhibited. If more stimuli are entering the brain and being experienced, under materialism those extra experiences still _are_ certain types of brain activity that, therefore, must be observed to increase. My book Why Materialism Is Baloney elaborates on all this extensively. Great blog post. I am glad someone else noticed the shallow analysis in the Guardian article, and commented briefly on FB. I didn't read the original paper, but suspected it may have been misrepresented. Good job in highlighting the sloppy thinking that often underpins much "analysis" in popular media, and also in many science journals. I just read an article about near death experiences in Scientific American, and it boggles the mind how such stuff gets past peer review.The evidence and debates should laid out clearly, not glossed over to hurriedly affirm the dominant materialist view. This is an old thread, but regarding the filter hypothesis, if brain activity is considered as a symphony of voices, some of those voices might cancel out others in the way that two superimposed vibrations can result in a 'null' string. In this case, inhibiting one voice would not result in more brain activity, rather in 'reduced' brain activity that is simply easier to discern, and is more pure, so to speak. Typical B.S. I did hundreds of LSD trips in the hippie days it shows you the blueprints of life. Great article. I also question this push for people taking Ayahuasca. Do you have any thoughts on this Bernardo?